← Where were you 4 years ago? More about “mutual enrichment” comes from Catholic World Report. First there was a piece Fr. Peter Stravinskas, who made suggestions about how the older, traditional form of Mass should be altered. HERE I think he was wrong in the very notion of adaptations… now, at least. We need a long period of stability before the organic development of worship can take place in a healthy way. We need at least a generation, a life time, for the Usus Antiquior to become normal again. Fr. Stravinskas has made some great contributions over the years (e.g., he was a staunch ally in the trenches during the first “new translation” war… a second is looming – TWI & TWII? ), but I think he put his foot wrong in this topic. Let’s move on. Now at Catholic World Report we see a piece by Dr. Adam A. J. DeVille, a prof at the University of Saint Francis in Fort Wayne, IN. He offers Eastern Catholic liturgical rites as a source of mutual enrichment. NB: DeVille isn’t talking about Eastern enrichment of the traditional Roman Rite specifically. His is a more general East meets West presentation, what we Latins can learn from the East in the midst of our manifold liturgical woes. and the faithful, especially some of the readings of the Old Testament. antiphons and chants were tied to the readings. Repetition is the essence of liturgy. DeVille describes the attitude of many liturgists as “condescending” towards lay people, or anyone who doesn’t have a degree. This was a constant problem in the first translation war. It continues today. How true is his rhetorical question: “Have you… ever seriously consulted the people God about liturgical reform? Or was it imposed from the top down by a papal fiat beholden to a commission of ideologues?” Bingo. Abandon the mania for fake jobs: stop the scandal of a dozen lay people traipsing up to the front to hand out the Eucharist to a few dozen parishioners like biscuits at a parish tea. Keep the “Amen” comin’, brothers and sisters! [D]emand more of people before the Eucharist by restoring the ancient requirement of fasting from midnight, [See my posts on that and the POLL on the sidebar!] as the East still does. In fact, restore more serious fasting throughout the year. Stop assuming people can’t fast today or don’t need to. Many of us spend too much of our time sitting in front of screens—not hauling coal out of the ground, or thousand-pound nets of fish out of the sea. A little fasting for us with our bloated existence is eminently suitable. He goes on to talk about the restoration of Octaves. Do I hear an “Amen!”? DeVille also touches on the disdain that Easterners, especially the Orthodox, experience when they see what we dopey Latins are doing to our churches and worship. The horror! The horror! Toward the end of his excellent offering – and these are hardly exhaustive of the good points he makes – we have to remember that our liturgical live costs money. We need to sacrifice to build beautiful churches, make beautiful vestments, foster beautiful music. On that note, please donate to the TMSM (501(c)(3))! Lastly, I will expand on a superb suggestion: restoration of Communion rails. True. Nothing prevents Westerners, Latins, Romans, from using also Byzantine art and imagery. However, I say “Let Romans be Romans”! At the top of his essay, DeVille makes the important point that no Rite is pure and without outside influences. The Roman Rite has strong strains of the Gallican uses, which were imported. They were imported and absorbed and made Roman. Something inherent in Romanitas is the ability to adopt and absorb. This is part of the Roman genius. So, fine, we can also adopt and absorb Eastern elements. That said, when it comes to adopting Byzantine elements now… no, I have to resist that. What I want is a full-blown and fair restoration of the Roman Rite in all its potential. That means, of course, restoration of the older, traditional form of the Roman Rite. Modern people are rightly all agog when they attend splendid and grand Eastern Divine Liturgy. I am too. It is grand and unapologetic and precisely what it ought to be. That has its effect, especially on those who are only partially churched, are low-church protestants, or are your typical, Novus Ordo suburban Catholic parishioners. The Roman Rite in all its possibility has nothing to apologize for either. When it is executed with all the stops pulled out, it is grand and precisely what it ought to be. Thus, while I adore the Eastern Divine Liturgy (as a matter of fact for a couple of summers I sang for Ukrainian Divine Liturgy every day), I want Romans to be Romans. Let’s bring our liturgical standards all the way up to what they can be. Yes, we can learn from the attitude of the East. We don’t have to become quasi-Eastern in order to have worthy sacred liturgical worship. DeVille doesn’t say that we do. He is careful to distance himself from that. But there are those who do think that way. No. A hundred times, No. Hence, I am all in favor of DeVille’s piece. You must rush quickly over there to read it in its entirety. Fr. Z kudos to Dr. DeVille. This entry was posted in "How To..." - Practical Notes, Both Lungs, Fr. Z KUDOS, Hard-Identity Catholicism, Liturgy Science Theatre 3000, Our Catholic Identity, The future and our choices and tagged Adam A. J. DeVille, Divine Liturgy, Eastern Catholics, mutual enrichment, worship. Bookmark the permalink. Reading Martin Mosebach fast becomes like speaking to a wise old friend (his book, Heresy of Formlessness). My wife and I read it together and learned much from him. To pick my all-time favorite nit, “Byzantine” just means “Eastern Roman.” In many ways they are more Roman than the West. Y’all are Latins, not Romans, unless you’re in Rome. Point well taken about Latins being Latins and not Greeks, but why must all Latins be Romans? Even the most conformist among the Greek family of churches doesn’t demand the absolute worldwide conformism of every tiny detail that is so common to modern Latins of all liturgical preferences. It wasn’t always thus. @Matthew Gaul: I hear you. But small is neither good, beautiful, or true when we are called to unity as a Church. As “Latins” we give primacy of place to the successor of St. Peter, who clearly had primacy of place among the Apostles in sacred scripture. Put simply, because the Pope is in Rome, we associate ourselves with the same place. Our deference to the Holy Father stands even when we might not agree with him on matters that are not associated with the Magisterium [“a proximate norm of the faith itself in need of a norm (norma normata): regulated by divine revelation, which alone is the ultimate norm of the faith. This is its proper grace: that capacity of discerning the authentic sense of divine revelation. For which reason it has the power to tell the faithful what they must believe and do” (Father Joseph de Sainte-Marie, OCD)]. On reading very enthusiastic reviews from many trustworthy sources (along the lines of “If you read only one book on the traditional rite, this is it! !”), I picked up Mosebach’s book. I have to say that I found it strange, meandering, esoteric, and – dare I say – formless. I kept trying to pin down what he was trying to say but eventually gave up. The best explanation I could come up with is that he’s talking about a lot of European preoccupations which I’m not clued into. I’m still trying to figure out what all the fuss is about. Can anyone explain what I’m missing? I love this post. Doesn’t it all com down to letting ourselves become small? Putting God again at the center of the Mass? We have become a community of compromise. Putting our own comfort and wants ahead of God. For most of us serving God has become serving ourselves. The notion of the mystical Body had unfortionatly for many meant putting ourselves on par with God. Why has it become so unfashionable to think that we must suffer for God? He who humbled himself to die. Even death on a cross. To deny our need to recognize it is to deny His need to do it. To deny His need to do it is to deny Him. I would advocate that the NO be shut down as fast as it was introduced. It’s been a while since I read Mosebach’s book and it was borrowed so I don’t have it at hand but…if I’m not confusing it with another book… I thought it originated as various articles he had published. So maybe that’s why it seemed meandering to you? majuscule: That might be it. I’m willing to give the book another try with that in mind. @Sam Schmitt: Regarding your questions about Martin Mosebach’s book: St. Augustine has an often misquoted saying, “Interficere errorem, diligere errantem”: Kill the error, love him who errs. You might recall the story of Paul Revere’s midnight ride wherein he yelled: “The British are coming! The British are coming!”. In Martin Mosebach we find someone like unto Revere, only Mosebach is yelling Augustine’s “Interficere errorem! Interficere errorem!”. It is an important work because several years have passed since many abuses of the sacred liturgy have become commonplace. We need a Mosebach to grab our attention by shouting “Kill the error!”. Another Latin phrase is worth noting to continue this line of thought. “Gutta cavat lapidem” (dripping water slowly erodes the stone). We do not want to become insensitive to the problems in our Church because one or another of them might have become a common practice. The way that liturgy is celebrated establishes within man his understanding of faith [the more precise adage: “Ut legem credendi lex statuat supplicandi (Prosper of Aquitaine)]. Since Jesus is the content of faith we do not want to misplace our understanding of him, whom we must follow closely behind. Dietrich von Hildebrand wrote that today’s problems are worth shedding many tears over (The Devastated Vineyard, 1973). And so, it means everything that we ponder the precept of charity, putting prayer at the center of our life, because it is the greatest thing that we can do: to be authentic in identifying ourselves with Christ, and also for the sake of our neighbor. Being educated about our lost traditions helps to this end of weeping with Mary for the harm that has been accomplished, even many years prior to the last Council. Martin Mosebach shares with his reader his personal–and often emotional–struggle to return to the beautiful traditional liturgy that he knew as a younger man. We learn through his shared experience of history, as well as through the “ups and downs” of his emotion, which are expressed so well through his writing in The Heresy of Formlessness. Fasting from midnight for all Masses is ill-advised for people with certain medical conditions, particularly for those Masses celebrated later in the day. To accommodate these, you’d have to start having lists of “categorized exceptions”, which strikes me as needlessly complex. The present single hour, I agree, is probably too short. The previous three hours would be better. On an individual basis, if circumstances require attendance at an anticipatory Mass, and the person can go all day without eating anything, then I’m sure that it would be meritorious. But I do not think it should be required. It could be dangerous for some. After all, sacraments exist for the person and not the contrary. @Kerry: Gratias ago tibi! I was merely trying to make a point without being precise about the history of Paul Revere. Next time, I will make the same point using a different example because of what you have shared with me. Let me ask a question: Is the problem with the NO truly that it is “inorganic”, or, more simply, that it was based on flawed social and theological outlooks? [The answer is Yes.] And if the NO truly is so bad – which isn’t necessarily something I’m going to try and dispute – is an appropriate solution really to leave it in place? [Be realistic, not a dreamer. It’s here to stay for the foreseeable future.] Were we to find ourselves with a more liturgically-inclined Pope in the immediate future, and were he to sit down with his advisers and produce for us a “Mass of Pope Gregory XVII”, is it really likely that it would represent anything other than an improvement over the current form? I am far from convinced that the dangers of getting it wrong (again) outweigh, either in cost or likelihood, the potential for getting it right. Even moreso when you consider that “at least a generation, a lifetime” leaves all of us, and probably all of our children, wallowing in bad liturgy and the bad theology that naturally accompanies it. I have already noted my belief that the traditional lectionary (including that of the Dominican Rite, which has considerably more Old Testament) needed additions, esp. for the ferials in Post-Epiphany and Post-Pentecost, and for the sanctoral, which has mostly a very limited number of commons readings. But, I finally think something needs to be said about what the principal problem with the new Lectionary is: “lectio continua”. This lies behind the three year Gospel cycle on Sundays (for Gospels) and the two year cycle for weekdays (for First Readings). Lectio continua (continuous reading of a Biblical book straight through) works in the Office. It is a grave problem at Mass as it produces incoherent sets of readings for each Mass. That the method of expansion was bad, does not mean a more expansive lectionary is itself bad. Abusus non tollit usum? Fr. Z wrote: We need a long period of stability before the organic development of worship can take place in a healthy way. We need at least a generation, a life time, for the Usus Antiquior to become normal again. Please fight for your liturgy! I am a Byzantine-Ruthenian Catholic. Since Vatican II Rome has been directing our Church to restore our liturgy and stabilize it matching the de-latinized liturgical books Rome printed in the 1940s (since our Church in Europe was oppressed during the War). Decade after decade the Ruthenian Catholic bishops ignored it. Matins disappeared. Then Vespers. Then the Divine Liturgy kept being made shorter and shorter. The 1990s directive from Rome to restore it was ignored. In 2007 the Ruthenian bishops issued what they call the “Revised Divine Liturgy.” It’s full of gender-neutral politically correct language. Gone are “man” and “mankind” (they are replaced by “us”). In the Creed we no longer sing “Who, for us men and our salvation.” We instead read “Who for us and our salvation.” The liturgy has been streamlined. Whole parts have been removed and praying them is disallowed. The official, normative form issued by Rome is prohibited. The translations go from literal (which are often laughable) to paraphrase (which are occasionally almost heresy). And on top of it they replaced liturgical chant with new settings that make the singers sound like they are not native English speakers. Please do not let this happen to the traditional Latin rite. Once you let them start changing things around the edges they will change everything. When that happens your churches will be empty. Like ours. @Kerry: No problem. I was sincere in my comment to you. I think that language should be accurate. I now begin to wonder though: Do others experience Mosebach the same way that I did? It has been a few years since I read his book. Knowing what I do today about our tradition might give me a different perspective on the way that he writes. The more I learn about the EF and the Byzantine Liturgy, the more the OF (or the differences between it and the EF) seems less ecumenical. Perhaps instead of creating lists of exceptions for fasting, we could ask people to use their common sense. That’s what the exceptions were supposed to be for. The large majority of Latins ARE Romans. The exceptions today are the Ambrosians and a few religious orders. That’s why it’s called the Roman Missal. While I have never been to either Byzantine Catholic or Greek Orthodox services, I have been to a Greek Orthodox church and was struck by the fact that part of their Divine Liturgy takes place behind a screen. Not just “with the priest’s back to the people” but BEHIND A SCREEN, which is actually a wall with little doors in it. Puts things in perspective, doesn’t it? 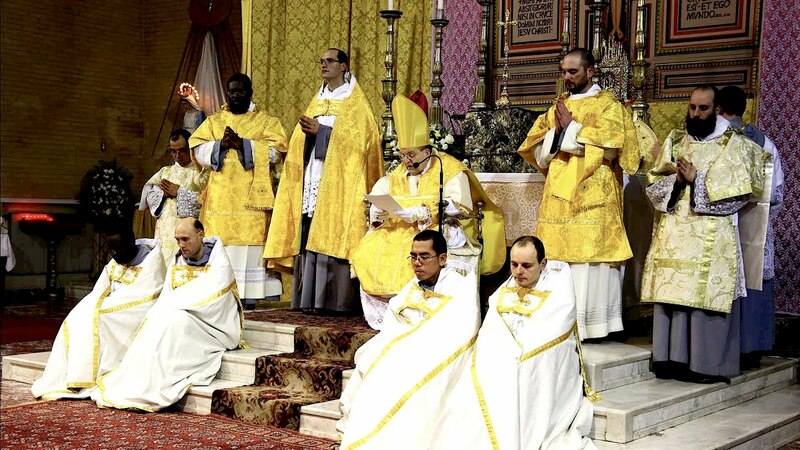 Anyway… what most strikes me about TLM or about the OF celebrated ad orientem is that the priest is doing the ritual, the way the Jewish High Priest did it in the Temple. The people are NOT. They are there while the priest does it. And yes, they are participating in it by uniting their prayer to the priests and by witnessing it and by eating the sacrament. But they are like the people in the ancient Temple, who came and went, while the priests continued offering worship. And that makes a lot more sense to me than gathering around a table for a meal that isn’t one. Joe in Canada – I agree! Common sense really gets us a long way. Fasting from midnight should be the norm (some Churches fast even from Vespers on Saturday evening), as it was until very recent history. Health problems have always existed, just as there have always been pregnant women, nursing mothers, young children, and those enfeebled by age, yet our ancestors of whatever rite observed a much stricter preparation for Communion and fasting regimen. Obviously people in these conditions or stages in life are not held to the same standard, nor should they be. Common sense. But a healthy 35 year old man can fast from midnight, even if he’s attending a later Mass. It’s not always easy, but that’s not really the point, is it? If he takes necessary medication in the morning with water or even a small bite of something to avoid stomach upset, then common sense would say that’s not contrary to the spirit of the general rule. If someone is attending an evening Mass, then fasting after breakfast or even just from noon seems like a reasonable alternative. Again, common sense, and it doesn’t even have to be legislated. @Joe in Canada: The point that you bring up regarding ecumenism is a major point of reference for Geoffrey Hull’s book, The Banished Heart. You might enjoy the way that he covers the history and surrounding conflicts. @Tom A……When you get elected pope, go ahead and make it disappear. In the meantime, those of us who understand the Church did not begin in 1965 do well to not base our faith on antipathy towards the Missal of Bl. Paul VI. The ordinary form of the Roman Rite can be, and is, celebrated with reverence. Furthermore, I contend that the liturgical reform of 1970 has opened the door to the Catholic Church making tremendous inroads in the southern United States. Dear Father Augustine Thompson O.P. : Others known to be scholars have made the point that the choice of readings for the OF lectionary clearly points to a theology that breaks with tradition. You are right to state rhetorically that abuses thereof do not preclude the juridical use of the OF and its lectionary. However, the break with long-held theology in the OF lectionary should raise eyebrows. I suspect that the common concern about the OF, by those who prefer the usus antiquior, is that the Eucharistic Canon (Mass of the Faithful) in the OF detracts from the sacred mysterious reality of Christ’s Parousia in the Eucharist (something that Scott Hahn said that we can speak of as Parousia). The major problem is the break with tradition, which was not intended by the Council Fathers, and that caused millions of our fellow Catholics to leave the Church. The new Mass is not to blame for their leaving, per se, because we all have a duty to attend a valid Mass in order to worship God, as he commanded us to. But, while you defend one side I stand on the other and say that no change in the OF will justify it when it began as a break with tradition. I will admit that a hybrid Mass that is an organic development of the Rite of St. Gregory the Great could move us in the direction that the Council document sacrosanctum concilium calls us to move in. Others here might agree with me that–already before Vatican II–we were seeing organic change in the liturgy that the Council Fathers might have wanted simply to support. At the beginning of sacrosanctum concilium the Council Fathers tell us that action should be subordinated to contemplation. Is it not peculiar, then, that many who prefer the traditional Mass state that an air of silence pervades that form of the Latin Rite, when it was a quality that they found lacking in the New Order Mass? We do not want a Mass that is juridical, and therefore valid. We want a Mass that expresses the fullness of Christ’s presence on the altar during the Anaphora, and that has grown out of nearly two millennia of Magisterial understanding of the mysteries expressed through Christ’s life. We want the strong meat of the Mass of the saints (cf. Heb 5:13-14). In summarizing the developments in Liturgical rites through to the Middle Ages, Jungmann notes that the Mass was no longer the collective act of worshsip of a congregation like the older Roman stational Mass from which it derived. As a rule it took place at a choir altar, situated in a chapter choir or sanctuary that had gradually gotten farther away from the nave and had become almost an independent clerical church, and so even from this viewpoint the Mass was truncated and withered looking. So , looking a some of the comments here I was struck by one that compared the Eastern rites to the Hebrew scriptures’ temple sacrifice, where the priest was totally separated from the people and offered sacrifices often.. But we have Jesus who offered his sacrifice once and for all, as emphasized in the letter to the Hebrews. I don’t see the old temple worship as a model for our Roman Rite. As the separation of the priest’s action from the congregation became more pronounced and separate from the meal, the invitation to “take and eat” and “take and drink” was ignored and observed in the breach. Fewer and fewer of the congregation ate and drank – to the point where the Church had to institute a commandment to received communion at least once a year. Finally, for these reasons, I would not welcome a return of the communion rail, or the use of an iconostasis which separate the priest from the people. But there is one thing that could benefit us from the Eastern practice: they have clergy who are married! What a concept! @Matthew Gaul….Most members of the Latin Church, when worshiping and praying in common, do so according to the Roman Rite, thus making the majority “Romans.” This seems simple and straightforward, or am I missing something? The GIRM states that, during the Eucharistic “those who do not kneel ought to make a profound bow when the Priest genuflects after the Consecration” (43). Whenever I see congregations standing during the Eucharistic Prayer, I very rarely see anyone making the profound bow when the priest genuflects after the consecration. The Eastern Church could teach us something in this regard because, though they don’t kneel, they are bowing for a longer duration throughout the consecration, and make the profound bows as well upon the conclusion of the words of consecration of both the Body and Blood of the Lord. If standing is going to be adopted as the posture during the Eucharistic Prayer at some parishes, we still need to bow. @jennifer p it must depend on where you are, unless you consider an hour and a half to be short. Father occasionally has a Saturday Liturgy in old church Slavonic and has switched to a version of the liturgy other than the one he’s supposed to use. Nobody knows where he got it but I have a guess. Mom’s funeral consisted of prayers for the dead, rather than the liturgy that was incorrectly used. Both kneeled and pews remain, however. I’ve been to the Greeks and Russians and, as is proper, they all use variations of the same liturgy. @Lucas Whittaker – Thanks for your thoughts on Mosebach’s book. Maybe I’ll give it another shot.